Click below & watch Marina’s live performance of her original piece “Cape Ann Song.” Lyrics are posted below. Many thanks to Gloucester’s illustrious Mayor Sefatia for the video! This Saturday, January 23, I am honored to join an all-star lineup for a benefit gala & concert for the Cape Ann Chamber of Commerce! Hosted at the stunning Shalin Liu Performance Center, one of the premier performance spaces north of Boston, this concert is not to be missed. Featuring the best & brightest from the Cape Ann music scene, this show will highlight 6 vocalists — hostess & event organizer Mari Martin, Kate Barry, Renee Dupuis, Megan McKenzie Downey, and myself — backed by a killer 4-piece band (Mark Retallack, Roger Brockelbank, Vinny Briguglio, and Jake Pardee). 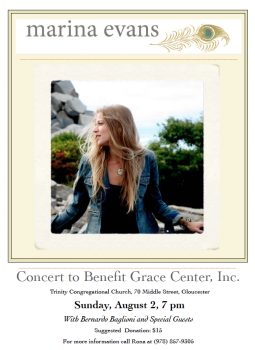 All concert proceeds will go to benefit the Cape Ann Chamber, a vital organization that supports our local businesses. Click here to visit the Chamber’s website to learn more about the event, or visit Rockport Music’s website to purchase tickets. In recent years, the Cape Ann Clergy Association realized that there was an ever-increasing number of requests to provide care, support, and resources to the homeless on Cape Ann. 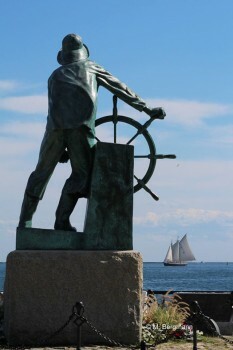 Following a needs assessment study in 2011, which identified the distinct need for a safe day space for Cape Ann’s homeless, the group formed the Grace Center, a fully staffed day resource center that moves from church to church in and around Gloucester, MA. Marina became aware of the Grace Center just this past year, and was impressed with the generosity and hard work the group has put forth to help those less fortunate in our community. Theirs is a valuable mission, and (unfortunately) reflects a growing problem Cape Ann faces in supporting an increasing homeless population. Marina came up with the idea to “come together in song” in support of this important cause. Together with her husband Bernardo Baglioni, as well as a special guest appearance by Gloucester police Chief Campanello, she put on an intimate acoustic performance in one of Gloucester’s beautiful churches. All proceeds from ticket sales were donated to the Grace Center, and Marina is proud (and pleasantly surprised!) to have raised over $1,000 in donations to the organization. 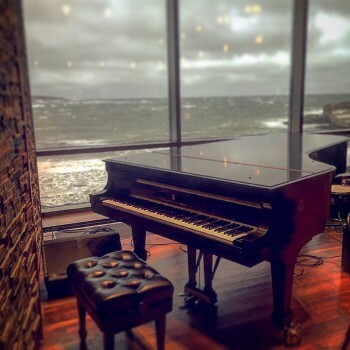 In celebration of the 25th anniversary of the North Shore Health Project, a leading agency for HIV and HCV support in Massachusetts, Rockport Music has put together a benefit concert at its gorgeous Shalin Liu Performance Center on October 17, 2014. And I am thrilled to be a part of it! 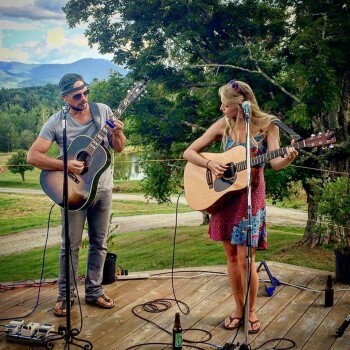 Cape Ann singer-songwriters Allen Estes, Fly Amero, Brian Alex, myself, and other special guests will open up the show with an in-the-round set of original music. Our set will then be followed by renowned folk songstresses Antje Duvekot and Meg Hutchinson, whose gorgeous voices, melodies, and lyrics are not to be missed! 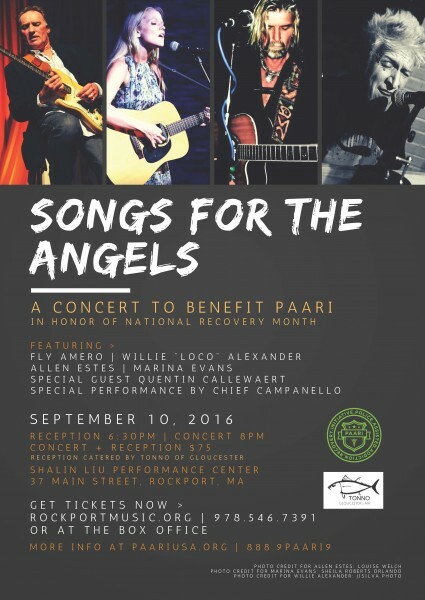 Proceeds from the concert will support the ongoing mission of the North Shore Health Project. To get your tickets and to learn more about the concert, click here; to learn more about the North Shore Health Project, click here. We hope you will join us, for great original music and more importantly, for a great cause! This weekend, I will be playing the part of Joni Mitchell in a LIVE recreation of The Band’s classic film, The Last Waltz! Presented by Last Dance Productions, and featuring a host of amazing local artists and the fantastic Rev Tor Band, this is fixin’ to be a great night of music. 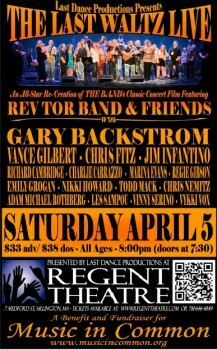 AND it’s for a good cause: this is a benefit concert for the ever-inspiring musical nonprofit Music in Common. In a lot of ways, this is a dream come true for me: Joni was the reason I started playing guitar and writing songs in the first place. And now, many years after my initial struggle through an oversimplified version of “Case of You,” I am thrilled and flattered to perform her beautiful song “Coyote” on the gorgeous stage of the Regent Theatre in Arlington, MA. Click here to learn more about the show and to buy your tickets. Thanks team, hope to see you this weekend!